Set on the south edge of Bath, the steep Midford Valley offers spectacular views across the Cotswolds towards Wiltshire. Our client briefed a substantial renovation of their recently acquired valley-side property to unify the various alterations made over time to the original 19thcentury market garden cottage. 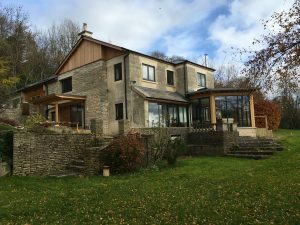 The property is situated within a substantial 5 acre plot, much of which is at a 25% gradient which in itself presented a range of challenges for the building team. It’s also in a Green Belt Area of Outstanding Natural Beauty so there were a number of compliance regulations to adhere to. An existing colony of bats in the surrounding woodland also provided its own housing requirements! The original Bath stone used throughout has been retained and cleaned wherever possible. Other areas have been uniformly clad with untreated British larch which will gently silver over time to allow the building to blend with its surroundings. The garage was also boarded and its loft area converted to accommodate a ‘bat hotel’. 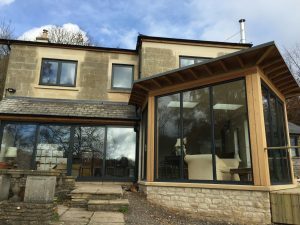 An outdated conservatory overlooking the valley was replaced with a 4-sided timber garden room structure with steel picture frame reinforcements invisibly integrated into the kitchen/dining room. The new garden room was designed to maximise the stunning views of the valley and allow light into the existing kitchen, so features full height glass with glass roof panels. 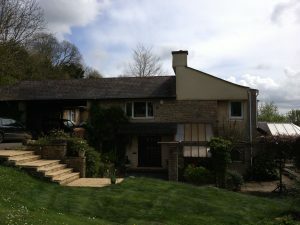 The main roof was previously mono-pitched, unsightly and out of character with the original building. The design for its replacement needed to work within the overall scheme and also take into account the visual impact of the building from the road and walkway above. The replacement double pitch is more aesthetically harmonious, drawing the new elements of the building together. A double height extension to the property now provides generous utility and bootroom space at the back so the front area with its stunning views is retained for daily living. An additional bedroom to the first floor was also provided. 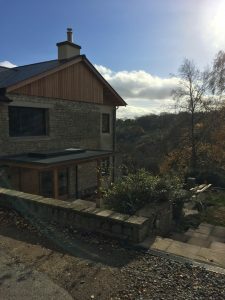 Extensive dampproofing and drainage works were carried out to the back section of the house as it’s set into the hillside; velux roof lights were used wherever possible to bring natural light into this darker area of the building. The finished result is elegant inside and out. Our client is delighted, and the design and build team are justifiably proud of their achievement. Nick says “we’ve reinstated a sense of unity, harmony and calm, blending new and old styles into this comfortable home”.